Justice represents Karma, Law and Balance. Past – Justice in the Past position represents a past decision that is playing out now and currently affecting your life. It doesn’t mean that your choice was good or bad, just that it is currently affecting your motions. Justice usually represents large decisions like moving house, a new job ,a new partner. Present – Justice in the present position means you have a big decision ahead of you. Usually we’re faced with decisions every day, but Justice means that your choice could affect other people a great deal and drastically change your life. Are you currently thinking about a new path to take? Future – Justice in the future position means you are working towards a large decision. You might have to choose between two jobs, or two partners. there will be enough time to think it over, but treat this as a forewarning. Work / Education – Justice showing in regards to work means that you should revise your current work/life balance. If all seems well, then have a look at your current workload in your workplace. are you working on one thing too much? Maybe it’s getting boring and you need a change, or maybe there is a way to spice up your current career with a little addition. Romance – Justice in regards to romance is an odd one. If you’re single, you may very well have the choice of becoming someone’s partner soon. If you’re in a relationship, it could mean that you’re about to split up. Either of these however, will be because of a mutual decision. Friends – Justice reminds you to have a good balance in your life. Think about your friends and try to understand if any of them are toxic to your other relationships or other areas of your life. if anyone is a positive influence on your life, make sure to tell them! Money – Justice is a lucky card in a way, so it might be a good time to splash out on something that could be worth a lot more later. If you’re current claiming some sort of compensation, Justice is a good sign that you’ll receive what you’re owed. 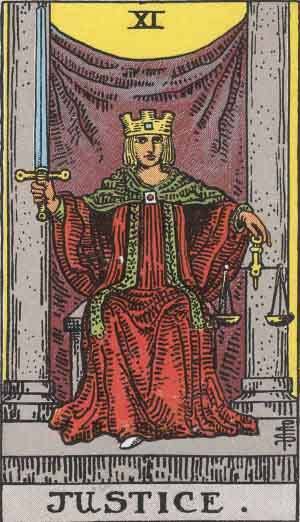 Health – Justice reminds you to balance your life. Too much of anything is not good for you. Take a moment to look at your body and mind from another perspective. Are you treating your body and mind well? Spirituality and Mentality – Justice represents balance. balance and equilibrium are cornerstones of many spiritual (and esoteric) practices. It’s a good time to consider the opposing view of what you currently believe. In reverse, Justice may reflect some dishonestly that is happening in your life, either from you or people you know. Somebody may be withholding the truth, or at least keeping something from you. Analyse any potential for deceit from your friends and family. It may also reflect something that has gone unpunished, which is negatively affecting your life. As a Yes or No question: Not certain. If the question is moral, then Yes. Otherwise, no. We’ve selected live tarot readers to give you a FREE 3 Minute interpretation of Justice! Scroll through them below and pick your favorite one.